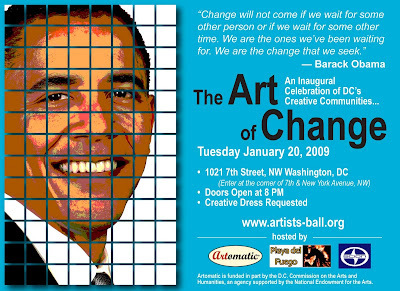 Artomatic, Inc. and Playa del Fuego, Inc. – institutions of the mid-Atlantic arts community – have joined together to create this year’s most distinctive inaugural celebration, The Art of Change (www.artists-ball.org), on Jan. 20, 2009 at 8pm. With the generous support of corporate sponsor Scion (www.scion.com) and location sponsors The Warehouse Arts Complex (www.warehousetheater.com) and Douglas Development (www.douglasdevelopment.com), this event brings Washington, D.C., a unique opportunity to celebrate the inauguration of Barack Obama as President. Tickets are available immediately for $50 at www.artists-ball.org. Occupying three separate venues on the 1000 block of 7th Street, NW in downtown Washington D.C., The Art of Change will feature visual and performing arts, multiple dance floors, fire dancing and live music. DJs from across the mid-Atlantic region will be spinning an eclectic mix of musical styles on two dance floors, and in The Art of Change Galleries, displaying artworks created for this celebration. The Variety Stage will showcase performances all night long, including live music, comedy, belly dancing and spoken word poetry. And outside, attendees will enjoy fire-dance performances while dancing to up-and-coming DJs in the heated White Tent. For more information visit www.artists-ball.org. - Movies are way too long and too many fighting skirmishes in both of them and zero plot to them. - Benicio del Toro does a great job as Che, but supporting actor Santiago Cabrera steals part one as Camilo Cienfuegos. - Part one and two delivers Che as a champion of the poor, the illiterate, the peasants and generally everyone who is shoeless. Even a light reading of Che's own writing and memoirs would reveal that this simplistic offering of this highly complex figure is incomplete and perhaps even dishonest. A more balanced approach should have included the Guevara who was judge, juror and executioner, and the inexperienced post-revolution Guevara who helped to destroy the Cuban middle class, the island's business infrastructure and its agricultural base. - Part two is a huge disappointment in its lack of character development or even the slightest explanation why the storyline jumps from Cuba to Bolivia. Che's Bolivian guerrillas, which never numbered more than 51, included 17 Cubans who went along with Guevara in his effort to "export" revolution to the Americas after secret failures in Africa and Venezuela. The Cubans, who looked and talked very different from most Bolivians, held nearly all the command positions, but they were unable to speak the local Quechua or Aymara languages of the indigenous local Indians. This doomed the effort. More later! I gotta go watch some football! Read Jeremy McCarter in Newsweek here.